I came here to get warm, but it didn't happen. It's just freezing around here, and I have all kinds of summer clothing with me. I just didn't believe that is was really in the 30's here, but it's true. Yesterday, I went to Nogales, Mexico, and it was even colder there. . . Believe it!!! I would write more, but I'm at the library and this computer will click off pretty soon, so I'll tell you more happier things tomorrow. It's really quite beautiful here and would probably be a desireable spot to retire except in December and January. The buildings are new and clean, and the landscaping is quite unique. The Desert Museum, is more of a nature walk than that, but walking around on the cobblestones is not the best when your popsicle toes are frozen. . . . .
and . .. goodbye to Alaska . . . as I'm visiting Tuscon AZ for a while . . . time really slips away from you. I simply have to tell you about one of the neatest things I've seen lately. At the Tuscon Airport, they have a huge monitor and big easy chairs to sit on, while you wait for someone. The video is set on the hall leading down to the baggage claim, so you can view the party you're meeting, as they walk down to it. I was fortunate to wait for my sister on such a chair. They also have a large map posted with legends of all the cities that show arriving flights, and just when and if they arrive as scheduled. Also, the car rental is still right at the airport, so you don't have to shuttle over to some other spot. Very convenient. My first visit is great, and I'll tell more in future blogs about the great library, downtown architecture, landscapes, etc. But for now, wait with baited breath, please . ..
My Christmas letter is posted on my webpage if that's what you're after. There's not a lot for me to post today, as all the usual Christmas activity is taking place around here. The temperature has been below zero for a few days now, so I'm hiding indoors, unless I have some commitment elsewhere. This week does require some running around, as all of the clubs have their Christmas events. I've only gained five lbs. so far, which is minimal considering. There are also some sad things that we learn have happened elsewhere and here, friends passing, businesses closing, social breakups . . . well, you know -- I'm sure the reader is experiencing the same thing. It's hard to absorb all at once, but this is when news arrives on the annual cards. 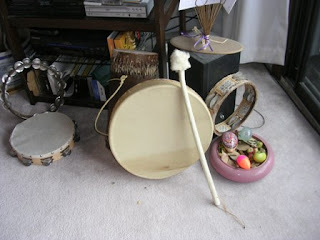 So I'm going to wrap up the week with solstice drumming . . . yes, I made that Eskimo drum above . . . and flight to Arizona for a few weeks. I'll try to post from there, but who knows what to expect. Labels: Escape the chill . . . This is one of the better Christmas cards! Give a click! It's a beautiful day in Anchorage, and we're all getting ready for Christmas. We need to keep using that word, because, after all, it is honoring the birth of Christ. As I receive Christmas cards, and notes, I realize there are so many friends out there that plan on visiting Alaska. However, they don't want to experience our cold winters. I can only say that this winter, 2007, is the warmest we've had since I arrived here in 1966. There's just a brush of snow on the ground, and at this time none predicted. It's okay with me, but it does make the long nights longer, as it's pretty dark out by 3 p.m. This would be depressing were it not for the lively activity and events throughout the winter. It's really a good time to see the non-touristy parts of the state. Christmas brings some wonderful concerts, chorales, ice-skating on the local ponds, marginal skiing in town, but better snow at our resort of Alyeska. Also, the prices are much more attractive. But the biggest attraction, at least for me, is viewing the Northern Lights. The image above is part of what you will see, but the best part is the undulating waves, rolling across the sky, and there's just something magical in it. It's even better if you're watching it from a horse-drawn carriage, which they have operating downtown in Anchorage all winter. Town square is a city block that houses many fairs and carnivals in the summer, but in the winter, they have ice-sculturing, and ice-skating pond, and real live reindeer lead Santa into the tree-lighting ceremony. Like most large cities, parking is at a premium here, but a new parking garage is being built as we speak. For young adventurers, and old are invited, there's a new hostel on Eagle Street, just north of Fourth Avenue, that has affordable accommodations and if you would remember the streets are named alphabetically from A street, you will find Eagle Street is 5 blocks east of the center of town. I'll tell you more about Anchorage and Alaska in my future blogs, but glad you visited anyhow! Don't forget to view my Christmas letter if you want my complete year, 2007. I thought that I should tell you a little about some of the local scandal in this blog. There's a big political scandal going on now, with some of our state politicians getting 5 and 6 yr. jail sentences for bribery and such, but the local radio personality had me laughing as he told the story of the bankrupt Matanuska Dairy. You may wonder how dairy cattle business can work in this Alaska Climate. Well, wonder no longer, it simply doesn't work. This 75 yr old company has been losing money for years, so a few years ago, the state came to its rescue and bought it. Now you know as well as I do, the state is not going to be able to run a dairy, but that was its intent. Our most attractive lady governor seems to have lost her mind, as she continually tried to revive it. When the Board of Directors said there was no hope, she fired all of them, and appointed a new Board. However, they continued to lose over a million dollars a month, so Gov. Palin put out for bids to sell it. Now who is going to buy such a company? My laugh came as radio commentator, Mike Porcaro, said that they had a box of sealed bids they would be opening on Thursday, so when Thursday came, they opened this box, and there were NO bids in it. Does this remind you of Geraldo Rivera? Sad, but true, so they are now supposed to close down on Dec. 17th, and sell what equipment they can. This is not unlike what happened to our huge, multi-million dollar building that housed the Alaska Seafood Institute. Now if you can't make a profit, paying only $1/yr. rent, and having an abundance of fish just down the road, something got to be wrong. Leave it to the state government to screw that one up, too. However, that story has a happier ending, because when they put out for bids, they got three! One was illegible handwriting of a local doctor, who is not known for any common sense, so that was discarded, and I don't remember the second one, but the third was a viable bid by Changepoint Church, which is a megachurch, and they have been doing some amazing things there since taking over around a year ago. But that is not the story for this blog. It's the dairy. It's totally ridiculous. They also have their home office in some now expensive real estate on Northern Lights Blvd. and I'm wondering what's going to become of that with the demise of the company. But it hasn't happened yet, and things could still turn around. Now isn't this funnier than reading about all the Christmas parties I've been going to? Sure is! Labels: remembering Eartha . . . Yes, it's time to post my Christmas letter, so goto my webpage and you'll find it. Rather boring, to me, but felt you at least have an option to read it or not. Today is the first day I've been chilly in my condo, so I just moved my space heater to my desk area, and I'm ready to admit it's winter. We're still waiting for snow here, but I'm in no hurry. I attended a unique fellowship meeting at a new church, called Changepoint, and it was to refresh our female lives. It was called RefresHER - get it? It was one of the most enjoyable visits I've had, and there were at least 400 ladies there, plus a few men in the stage band, and volunteering on parking, audio, video, etc. The reason I bring this up is that there were two ladies who gave a most humorous presentation on 10 No-No's for Christmas, and one of them was, "no email Christmas cards" . . I was pretty good on the other nine, but admit to doing most of my cards online this year. Of course, I have a few friends who don't like computers, and the only way to reach them is the good old U.S.P.S. So, today, I'm wrapping up my Xmas postings, and also this week ends my B-fit classes, too. My piano students are doing their wrap-up in the form of a 'recital' at the Museum on Sunday, and it's time to start my New Year's resolutions . . . a bit early, as I'm trying to leave things in good order for my trip outside to Tucson for a few weeks. Of course, you'll be hearing about that. So, bye for now.